2014 is shaping up to be an exciting year for The Dunwells, with the release of their second album and a slew of concert dates in the UK and here at home. Brothers Joe and Dave Dunwell and their cousins, Jonny Lamb and Rob Clayton, spent their formative years playing around Leeds, England, honing their chops in pubs and clubs. Their first big break came in 2011 when they came across the pond and performed at the Folk Alliance music conference in Memphis. Their impact was nothing short of astounding and led to the band signing on with Austin-based Indie label Playing in Traffic and a co-deal with the respected Concord Music Group that includes Paul McCartney, Valerie June and Alison Krauss. During the last two years, The Dunwells have appeared on The Tonight Show with Jay Leno as well as played to packed crowds at Red Rocks in Colorado, the Levitt Shell in Memphis and the Rock Boat. 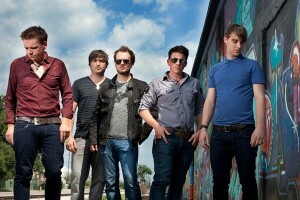 The Dunwells create a blend of emotionally driven rock that features four part harmonies. Their appeal is widespread, with influences that range from Foy Vance and Crowded House to Fleet Foxes and Elbow.